My Twitter friend Yemmi Agbebi, originally from Nigeria and a long-time resident of the United Kingdom, recently founded a new company, Telegramwire. Below is the company's press release (with British spelling, of course!). London, England - BBC Inspired News Broadcast, Inspires Telegramwire, A Worldwide Telegram Messaging Service And "Greeting Card Killer" which Launched December 16, 2013. 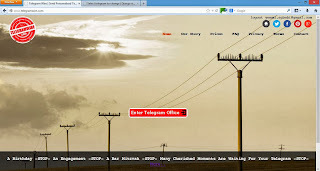 A BBC News broadcast of the closure by India of it's 160 year old #Telegram service, was the inspiration behind a new Berkshire dot-com and start-up, #Telegramwire, which is based along UK's M4 Berkshire Corridor. #Telegramwire is a Worldwide, cloud based, Letter Telegram service, which gives control back to customers, to create and send, original and thoughtful contents in the form of telegram cards to friends, families and loved ones. Telegramwire's Letter Telegrams, are suitable for celebrating a range of special and exciting moments including birthdays, christenings, engagements, bar mitzvahs, weddings, new baby, get well and so forth. Unlike pre-printed or online greeting cards which tends to recycle the same "production line" sentiments and poetry, Telegramwire gives customer the freedom to create unique, contextual and personalised greeting telegrams. This sender and recipient centric approach, encourages customers to do two things: (a) deploy their creative writing skills to create memorable telegram greetings that a recipient would value (b) the opportunity to engage the receiver, no matter how brief, on the common ground of memory; in order to write something meaningful and personally relevant; and which achieves something of an emotional connection between sender and receiver. Telegramwire carefully laser prints each telegram message, on a retro-style Telegram Form, using a unique and evocative font. The finished telegram is then despatched in luxurious and uniquely branded Letter Telegram packaging via Special First Class Mail, Air Mail or Signed-For Courier. The whole experience is designed to make the sender and receiver feel connected; in particular - the recipient is left feeling very special by the sender's originality and thoughtfulness. It costs only £4.99, EUR 6.20 or US $8.20 + P&P for one telegram from any country in the world to more than 190 countries Worldwide. This price point compares favourably with greeting cards, especially with some cards costing over four times as much as our telegram. Besides, it is not uncommon for some telegrams to be framed and cherished for their sentimental value. By comparison, no matter how pleasing a greeting might be, they are rarely framed. Framing as a keepsake is a unique gesture reserved for telegrams only. Life is full of many incredible moments worth celebrating, and Telegramwire's main purpose is to provide a unique and innovative channel to celebrate these exciting moments. Worldwide, telegrams have always enjoyed the unmatched distinction of conveying the most important news. For instance, in the days before Smartphones, Text Messaging, Email and The Internet; telegrams were the first messages to be read out at weddings, engagements, Christenings, Bar Mitzvahs, and so forth etc. The goal of Telegramwire is to bring back the wonderful feelings of exclusivity and nostalgia to our customer base of senders and recipients - during the most important moments in their lives. Yemmi Agbebi, MBA, CEO and Founder of Telegramwire said '...Rumours of the demise of the Telegram, as Mark Twain once observed in a similar situation, are greatly exaggerated. 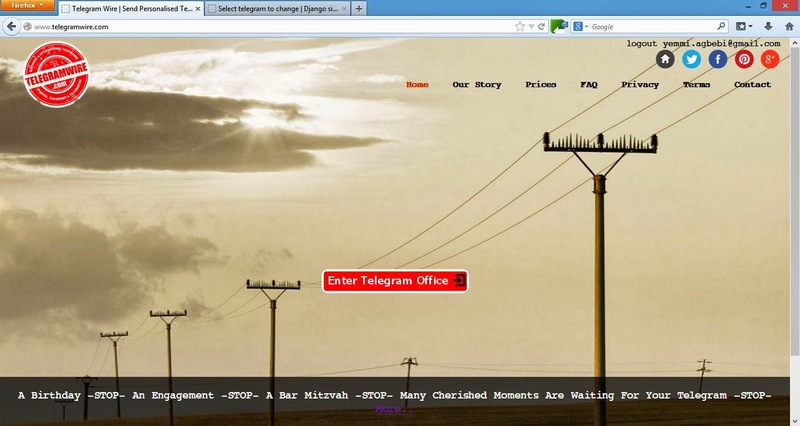 The telegram and it's evocative symbolism are very much alive and can be found at http://www.telegramwire.com/ "
Visit http://www.telegramwire.com/ for an immersive 'test-drive' of the "greeting card killer"!